I actually wrote a summarized version of this on Quora but then thought of doing a more detailed comparison of Spyfu vs SEMRush for SEO in this blog. Spyfu or SEMRush – it is a common question for many search marketing professional, both are great tools and choosing the right option isn’t easy. In this blog post, we are however considering the tool only from an SEO perspective and that makes the scope considerably easier. SEMRush is clearly the best when it comes to SEO, and I will explain why. However, the fact is SEMRush does all of these and a lot more that can really take your SEO to the next level. Keyword magic tool: This is really cool. This not only shows you a list of keywords but the keywords are already grouped by seed words ( similar to Spyfu’s keyword grouping). Besides, there are a bunch of filters available for you to easily identify the right keywords you want to target from the long list it produces on your seed word. 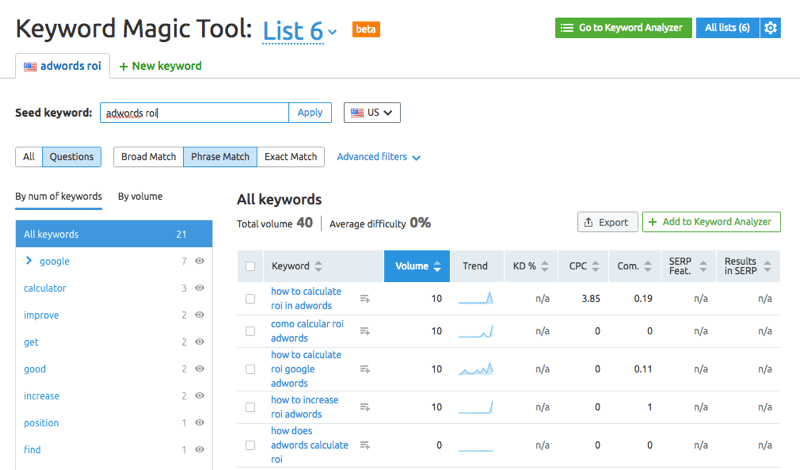 You can filter by word count, match type, keyword difficulty, SERP features and more. Also, another feature in the keyword magic tool is the “Questions” – where the tool identifies specific Questions that are being searched in Google for your keywords. And of course, you can export all these data to excel for further analysis and making decisions. Keyword Difficulty Tool: This helps you identify the relative difficulty of the keywords as well as provides details on the keyword trend as well as the SERP features available on that keyword. Besides keyword research, another important aspect of SEO is backlink and SEMRush does an awesome job at Backlink research as well. And remember this tool is not just for your domain but you can and should use it on your competitor domains to get all the relevant intelligence. Link Building Tool: This is a complete tool that would help you identify the right link targets for your website. Once the targets are identified and selected the tool also helps to get detailed information about the website you’re viewing and the people affiliated with it. You can see contact information, social web information, links to your website, and initiate contact right from there. Toxic Score: SEMRush has something called toxic score which basically identifies which of the links are toxic, harmful to your website. The higher the score the more toxic is the link. Once you have run a backlink audit on your site you can see the toxic links easily and there is a very easy workflow to add this toxic link to a disavow file and then submit to Google. Besides keyword research and backlinks, the other key piece in any SEO strategy is content and content is even more crucial today as it becomes increasingly difficult to build links. SEMRush provides a lot of help in this whereas Spyfu does not provide any support on content. SEO Content Template: The way this works is that you enter your keyword and the geography you want to target, you can also specify if you want to customize the content for specific device (e.g, desktop or mobile) and the tool analyses the top 10 content ranking for that keyword and gives recommendation on how your content should be. The recommendation they provide is pretty detailed including semantically related words, backlinks, readability, text length, use of heading tags as well as a detailed list of all the links so you can review the content manually if you would like. 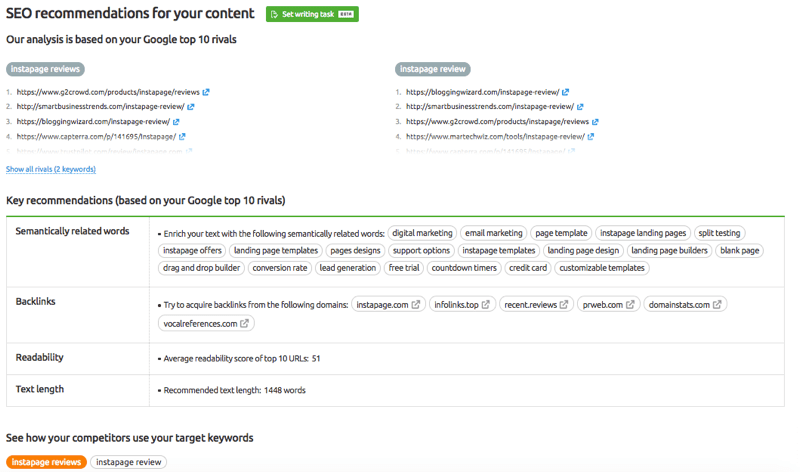 SEO Writing Assistant: Not sure if they have launched this tool commercially yet but this is available on Product Hunt. I do a lot of my writing on Google doc and I love the fact that this is available as a plugin to Google doc. The plugin connects to the SEO content template that you have created inside SEMRush and then as you write the content, it evaluates and provides recommendation based on the template. You will find a lot of helpful info using this SEO writing assistant plugin including Ease of reading, displayed as a readability score, word count, other recommended keywords that you should cover besides your core keyword and also an overall score on how your content stands against benchmarking. This definitely helps a lot with optimizing SEO content. If you have already written a piece of content, you can still create an SEO Content Template in SEMRush and then use this SEO Writing assistant to evaluate and optimize it. Topic Research Tool: One of the common problems faced by content marketers is to keep producing interesting content that is relevant to your business as well as interesting to your audience. SEMRush’s topic research tool is another great tool – you enter your target keyword and the tool will generate a wide range of content ideas around your keyword. The content ideas are basically content that has been published on the web about your keywords as well as a diversified range of topics on recommended keywords that can greatly improve your organic traffic. The tool provides Top ten headlines that have the most links on the topic as well as top 10 questions on the topic. And it also has a mindmap for topics that can be ideal to come up with new content ideas. Besides the above-mentioned tools, SEMRush has a bunch of other SEO tools that are equally helpful. SEMRush On Page SEO Checker: This is a little more extensive than the typical on-page SEO tools. You will need to add the page you want to analyse, enter the keywords and go through a few other setup steps for the project. Once the project is set up and ready you will get a very detailed report comprising of technical SEO ideas, SERP feature ideas, Semantic Ideas, content ideas and a bunch of other info. You can also get some UX improvement ideas if you have connected your Google Analytics with SEMRush. It also provides an estimation of how much your traffic can improve if you implement all the recommended features. Position Tracking: You can enter the keywords that you would like to track for your domain and the SEMRush will keep the rank tracking for your domain. What I like about SEMRush’s rank tracking capabilities is that you can view your current rankings as well as previous ranking and the change in ranking. It also tells you the SERP feature available for the keyword and which URL in your website is ranking for that keyword. SEMRush Sensor: This is a unique feature in SEMRush. This indicates the volatility in SERP and you can narrow this down by verticals, filter by geography or device. This could be useful to keep a track of which sites suffered/ gained the most during a Google Update as well as you can refer back to the volatility score if you see a sudden drop or surge in search engine traffic for your website. SEMRush is obviously known for the competitive intelligence it provides and that is where the main competition is with Spyfu – whether SEMRush or Spyfu provides better SEO competitive intelligence. As explained above, in general, SEMRush is way more powerful for SEO compared to Spyfu. 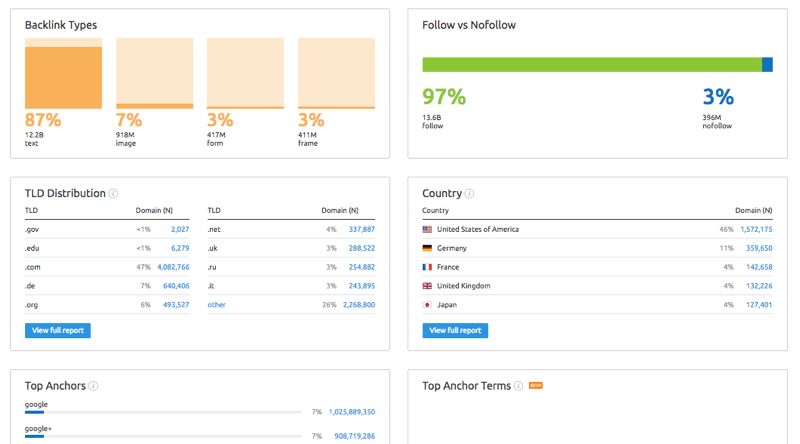 In terms of competitive intelligence both Spyfu and SEMRush provides some competitive intelligence and analysis of competitor’s keywords and backlinks though I found SEMRush to be relatively better. 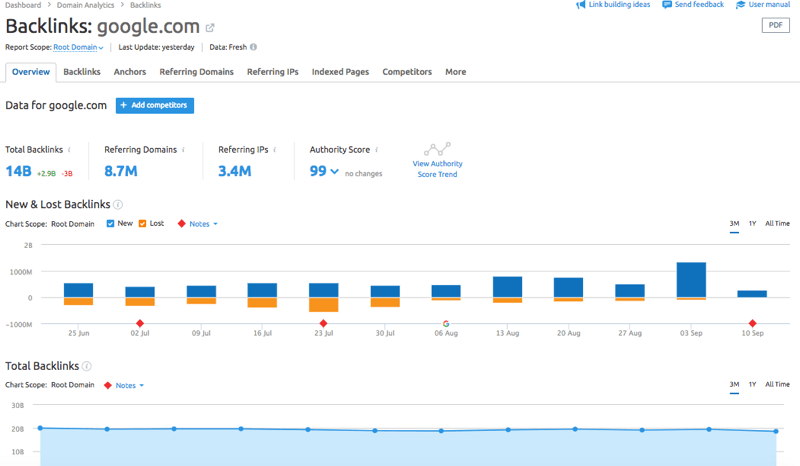 Spyfu allows comparison of three domains whereas SEMRush allows comparison of up to 5 domains. Keyword Gap: The keyword gap tool allows you to compare up to 5 domains based on their keywords ( organic keywords, paid keywords and even PLA keywords) and you can look at the data as either unique keywords for any of the domains or common keywords amongst the domains or even a full list of all keywords across your domains based on your needs. For each of the keywords, you will also get to see the domains rankings as well as a bunch of other related data for the keywords. Backlink Gap: This allows you to compare backlinks up to 5 websites. The tool lists all the links across all the competing sites along with the Authority Score of the respective links. It also shows which link is for which website and also if a link is present across multiple websites. SEMRush is a great tool for SEO and provides a host of other competitive intelligence and though this discussion is specifically about SEO, I must mention that SEMRush is a complete tool that can support you across paid search, social media and your complete digital marketing needs. Spyfu is a good tool but if you are asking me to make a choice between Spyfu vs SEMRush, I would any day pick SEMRush as a much better and complete SEO tool. Check out the About SRC Page for more details about Saptarshi Roy Chaudhury. I am a digital marketing professional with over 16 years of experience. I have held marketing leadership roles as well as worked as a digital marketing consultant for clients big and small, across the world, including some of the major global brands managing large-scale ad campaigns. Over the last 8 years, I built the marketing function for a 10-people startup, from scratch, to grow into a multi-million dollar company.